Tragic news from Pomona, where a 63-year old man riding a bike was killed in a drive-by shooting early Thursday morning. Pomona resident Robert Arthur Fausto was shot at 12:49 am by the occupants of a small blue car, and pronounced dead at the scene. Shootings like this usually turn out to be gang related, although the victim’s age might argue against that in this case. Either way, he’s one more needless victim of violence. And one death too many. 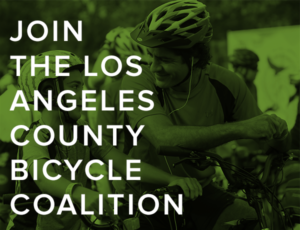 LACBC neighborhood chapter Bike Culver City wants your signature on a petition calling on the city to stand by its ten-year old promise to complete a bike network and build infrastructure by the end of next year. J. Patrick Lynch forwards a new documentary from a Pittsburgh public TV station, as they take a 335-mile ride along the Great Allegheny Passage and C&O Canal Towpath from Pittsburgh to DC. The video is available free until the end of this month. 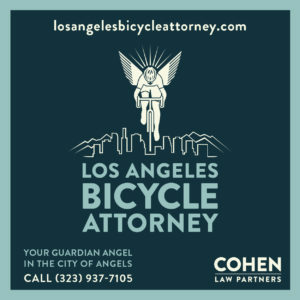 US News & World Report — yes, it’s still around — questions why Los Angeles is so dangerous for bike riders. Then fails to answer the question, and digs about as deep into the subject as scraping your fingernail through the dust. 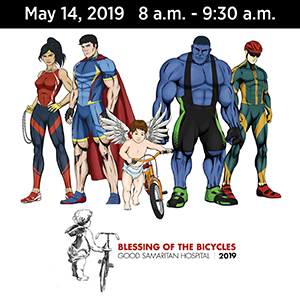 You’re invited to help form a “ginormous” human bike sculpture at the Rose Bowl next month. The Santa Monica Mirror credits LACBC neighborhood chapter Santa Monica Spoke for working with the city to improve safety for pedestrians as well as bicyclists through Leading Pedestrian Intervals. A new 47-unit housing complex rising in Long Beach will have just 40 parking spaces, along with bike storage and a bike lounge where residents can work on their bicycles. Just what the world needs. A $7,000, 45 mph ped-assist e-mountain bike made by a California company that would qualify as an electric motorcycle under state law, and requires a license, license plate and helmet. And isn’t likely to be allowed on any public trails. La Jolla has unveiled new artistic bike racks as part of a redesign of the Children’s Pool Plaza. Thanks to Robert Leone for the links. Santa Barbara is starting a weekly series of Cycling Without Age rides to help older people experience the joys of bicycling. Palo Alto will take another crack at bikeshare, after last year’s pilot program failed due to staffing problems. 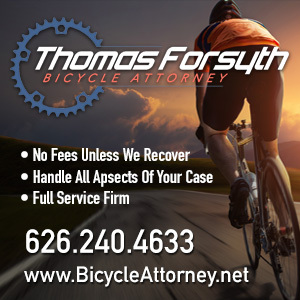 San Francisco settled for an undisclosed amount with a bike rider who was injured when a cop pulled his car into the bike lane he was riding in. A Bay Area writer hopped on an e-scooter, and rode as far from civilization as he could before the battery gave out. Or until it locked up when it didn’t show up in the app anymore. After months of discussion, Marin County finally approves allowing ebikes on paved bike paths and multiuse trails in county parks. Bicycling talks with the person behind a parody instagram account that pillories sexist cycling ads. Bike Snob’s Eben Weiss says there’s no such thing as just one bike you’ll love riding for the rest of your life. A new children’s book examines the perils of bicycle face and riding while female. There’s a special place in hell for whoever stole an 87-year old Texas man’s customized adult e-tricycle; it was his his only form of transportation after his eyesight started to fail. A Queens NY newspaper says bike riders should stay in their lane, and not speculate about how a fatal bike crash happened or say bad things about the driver. Which might be valid if the NYPD didn’t have a long established bias against bicyclists, and a history of wrongly blaming bike riders for crashes. Which inevitably leads people to question their conclusions. If you’re going to honor a fallen Philly pastry chef, a dessert-themed scavenger ride and bike rodeo makes sense. And calling it the ProfiteROLL, a stroke of genius. A Virginia couple will ride across the US to raise funds to fight preeclampsia in honor of their son, who died just days after being born prematurely; they’ve raised over $5,000 of the $9,000 goal. Charlotte NC plans to trade a traffic lane for the city’s first protected bike lane. A new foldout bar end bike mirror is designed to give you a rear view when you need it and fold away when you don’t. Good question. A Canadian paper asks what good is a dedicated bike lane if drivers park in it? A bike rider says breaking his arm in a fall restored his faith in his fellow Londoners, and convinced him the world hadn’t gotten as mean as it seems. Bicyclists in Manchester, England could soon get a winding, snake-style bike and pedestrian bridge as part of a $180 million bicycling and walking transportation plan. Ebikes are boosting bike sales in Germany, with sales up 36% in the last year; one out of every four bikes sold in the country is electric. After finally getting around to banning Tramadol from the pro peloton, pro cycling’s governing body is looking to ban all corticosteroids next year; some — such as the asthma spray that raised questions about Chris Froome — have been allowed under a therapeutic use exemption, or TUE. SoCal’s Coryn Rivera will wear the stars and stripes as she competes in Europe this year, after winning the US national championship last summer. The Highland Community New says there was plenty of great racing at this year’s Redlands Classic; too bad almost no one showed up to watch. When riding the 1,600-mile Baja Divide on two wheels is one wheel too many. And the bike-riding wizarding world of fire investigation.